The Twin Astir was a two-seat 1970s development of the Standard Class Astir CS, differing from it principally in having a fuselage lengthened by 9.75 in to accommodate the second seat, and also reduced in depth by 1.5 in; wing span has been increased to 17.5m (57 ft 5 in) and the wings are now swept forward 3° 18'. The gear retracts by folding up to the left and lying horizontally under the rear seat. The 3.3 degree forward wing sweep was replaced by a straight wing with leading edges at right angles to the fuselage centerline early in the production run. Dual controls are provided under the two individual canopies, and the Twin Astir is offered to customers both with and without the basic instruments in the front cockpit and with or without water ballast, of which up to 198 lb can be carried. 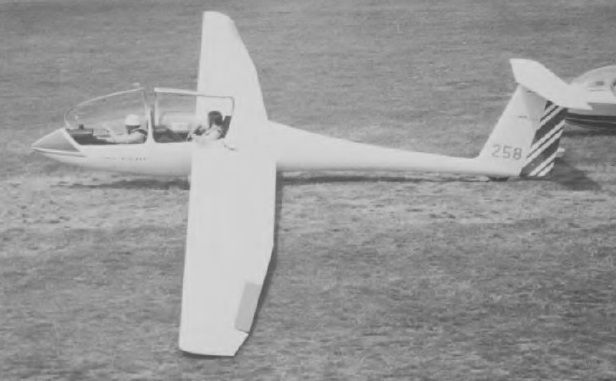 The Twin Astir has the same mid wing position and T-tail as its single-seat counterpart, and is of the same glassfibre construction. In contrast to later G 103 models, the Twin Astir has the main wheel ahead of the center of gravity, and does not have a nose wheel. It was offered with a tailskid or an optional tail wheel. The G 103T Twin Astir had a fixed main wheel. Design of the Twin Astir began in September 1974 and construction of the prototype was commenced in March 1976; this made its first flight on 31 December 1976. By the end of 1978 over 225 Twin Astirs had been delivered; production has now ended. The type is also known as the Twin Astir Trainer when used for this task. Formerly the G118, the Twin II is a new tandem two-seater for training and club use to succeed the Twin Astir, from which it differs in having a narrower and more streamlined fuselage, improved cockpit layout and larger canopies, lower-set wings, a fixed monowheel plus a small wheel (likewise semirecessed) under the forward cockpit and a tailwheel, downturned wing tips and reduced empty weight. 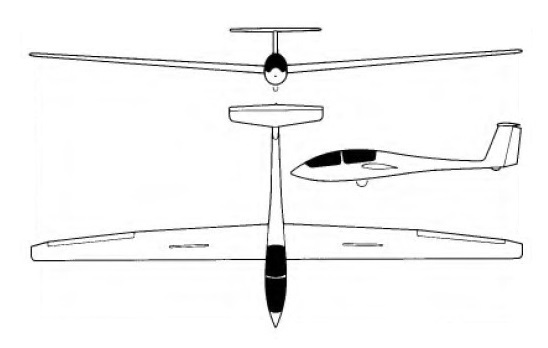 The same type of elasticated flaps as featured on the Speed Astir are fitted, and the T-tail is similar to the Twin Astir's. Unlike the latter, no water ballast is carried. The Twin II first flew late in 1979. The G-103 A Twin II was the successor of the Twin Astir with a nose wheel and a fixed six-inch main gear fitted behind the center of gravity in a fairing. The main wheel is equipped with a hydraulic brake. Modified ailerons produce a substantially improved roll response. Approach control is by top surface Schemmpp-Hith type airbrakes. The Twin II won the world Out & Return record for two-seat sailplanes (1000.88 km / 621.92 miles) flown by Tom Knauff of the U.S. The Twin II Acro is similar to the earlier model, but with strengthened mainspar caps and steel control pushrods which permit greater aerobatic performance. The Royal Air Force acquired 100 Acros (known as the Viking T. MK.1) for its air cadet training program. The G 103 has a FAA approved modification kit for all-hand control for handicapped operation. Air Transport Certified. 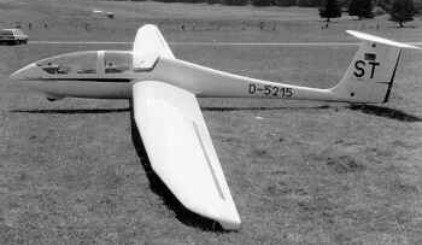 The G 103 C Twin III is a development of the Twin II with a new Discus plan wing of slightly increased span and modified airfoil section. The cockpit has detailed improvements including better ventilation, relocated airbrake levers to give better purchase, and canopies restrained by gas-filled struts. The unpowered sailplane is cleared for aerobatics similar to the Twin II Acro. The self-launching version (Twin III SL), which is non-aerobatic, has an electrically actuated mast-mounted retracting engine and steerable nose wheel. Fuel is stored in a main tank in the fuselage close to the engine, and in an auxiliary tank in the left wing root from which fuel is moved by a transfer pump. The variable pitch propeller has climb and cruise setting.